The turbopropeller-powered airplane flies and handles just like any other airplane of comparable size and weight. The aerodynamics are the same. The major differences between flying a turboprop and other non-turbine-powered airplanes are found in the power-plant and systems. The powerplant is different and requires operating procedures that are unique to gas turbine engines. But so, too, are other systems such as the electrical system, hydraulics, environmental, flight control, rain and ice protection, and avionics. The turbopropeller-powered airplane also has the advantage of being equipped with a constant speed, full feathering and reversing propeller—something normally not found on piston-powered airplanes. Both piston (reciprocating) engines and gas turbine engines are internal combustion engines. They have a similar cycle of operation that consists of induction, compression, combustion, expansion, and exhaust. In a piston engine, each of these events is a separate distinct occurrence in each cylinder. Also, in a piston engine an ignition event must occur during each cycle, in each cylinder. Unlike reciprocating engines, in gas turbine engines these phases of power occur simultaneously and continuously instead of one cycle at a time. Additionally, ignition occurs during the starting cycle and is continuous thereafter. the entire air mass to 1,600 – 2,400°F. The mixture of hot air and gases expands and is directed to the turbine blades forcing the turbine section to rotate, which in turn drives the compressor by means of a direct shaft. After powering the turbine section, the high velocity excess exhaust exits the tail pipe or exhaust section. Once the turbine section is powered by gases from the burner section, the starter is disengaged, and the igniters are turned off. Combustion continues until the engine is shut down by turning off the fuel supply. The turbojet engine excels the reciprocating engine in top speed and altitude performance. On the other hand, the turbojet engine has limited takeoff and initial climb performance, as compared to that of a reciprocating engine. In the matter of takeoff and initial climb performance, the reciprocating engine is superior to the turbojet engine. Turbojet engines are most efficient at high speeds and high altitudes, while propellers are most efficient at slow and medium speeds (less than 400 m.p.h.). Propellers also improve takeoff and climb performance. The development of the turboprop engine was an attempt to combine in one engine the best characteristics of both the turbojet, and propeller driven reciprocating engine. Mechanical reliability due to relatively few moving parts. High power per unit of weight. Use of propeller for takeoff and landing. Turboprop engines are most efficient at speeds between 250 and 400 m.p.h. and altitudes between 18,000 and 30,000 feet. They also perform well at the slow speeds required for takeoff and landing, and are fuel efficient. The minimum specific fuel consumption of the turboprop engine is normally available in the altitude range of 25,000 feet up to the tropopause. The power output of a piston engine is measured in horsepower and is determined primarily by r.p.m. and manifold pressure. The power of a turboprop engine, however, is measured in shaft horsepower (shp). Shaft horsepower is determined by the r.p.m. and the torque (twisting moment) applied to the propeller shaft. Since turboprop engines are gas turbine engines, some jet thrust is produced by exhaust leaving the engine. This thrust is added to the shaft horsepower to determine the total engine power, or equivalent shaft horsepower (eshp). Jet thrust usually accounts for less than 10 percent of the total engine power. The propeller of a typical turboprop engine is responsible for roughly 90 percent of the total thrust under sea level conditions on a standard day. The excellent performance of a turboprop during takeoff and climb is the result of the ability of the propeller to accelerate a large mass of air while the airplane is moving at a relatively low ground and flight speed. “Turboprop,” however, should not be confused with “turbosupercharged” or similar terminology. All turbine engines have a similarity to normally aspirated (non-supercharged) reciprocating engines in that maximum available power decreases almost as a direct function of increased altitude. Although power will decrease as the airplane climbs to higher altitudes, engine efficiency in terms of specific fuel consumption (expressed as pounds of fuel consumed per horsepower per hour) will be increased. Decreased specific fuel consumption plus the increased true airspeed at higher altitudes is a definite advantage of a turboprop engine. r.p.m. or both). In cold weather conditions, torque limits can be exceeded while temperature limits are still within acceptable range. While in hot weather conditions, temperature limits may be exceeded without exceeding torque limits. In any weather, the maximum power setting of a turbine engine is usually obtained with the throttles positioned somewhat aft of the full forward position. The transitioning pilot must understand the importance of knowing and observing limits on turbine engines. An overtemp or overtorque condition that lasts for more than a very few seconds can literally destroy internal engine components. One type of turboprop engine is the fixed shaft constant speed type such as the Garrett TPE331. [figure 14-2] In this type engine, ambient air is directed to the compressor section through the engine inlet. An acceleration/diffusion process in the two-stage compressor increases air pressure and directs it rearward to a combustor. The combustor is made up of a combustion chamber, a transition liner, and a turbine plenum. Atomized fuel is added to the air in the combustion chamber. Air also surrounds the combustion chamber to provide for cooling and insulation of the combustor. The gas mixture is initially ignited by high-energy igniter plugs, and the expanding combustion gases flow to the turbine. The energy of the hot, high velocity gases is converted to torque on the main shaft by the turbine rotors. The reduction gear converts the high r.p.m.—low torque of the main shaft to low r.p.m.—high torque to drive the accessories and the propeller. The spent gases leaving the turbine are directed to the atmosphere by the exhaust pipe. Only about 10 percent of the air which passes through the engine is actually used in the combustion process. Up to approximately 20 percent of the compressed air may be bled off for the purpose of heating, cooling, cabin pressurization, and pneumatic systems. Over half the engine power is devoted to driving the compressor, and it is the compressor which can potentially produce very high drag in the case of a failed, windmilling engine. may be reduced to 70 percent. In flight, the engine operates at a constant speed, which is maintained by the governing section of the propeller. Power changes are made by increasing fuel flow and propeller blade angle rather than engine speed. An increase in fuel flow causes an increase in temperature and a corresponding increase in energy available to the turbine. The turbine absorbs more energy and transmits it to the propeller in the form of torque. The increased torque forces the propeller blade angle to be increased to maintain the constant speed. Turbine temperature is a very important factor to be considered in power production. It is directly related to fuel flow and thus to the power produced. It must be limited because of strength and durability of the material in the combustion and turbine section. The control system schedules fuel flow to produce specific temperatures and to limit those temperatures so that the temperature tolerances of the combustion and turbine sections are not exceeded. The engine is designed to operate for its entire life at 100 percent. All of its components, such as compressors and turbines, are most efficient when operated at or near the r.p.m. design point. Powerplant (engine and propeller) control is achieved by means of a power lever and a condition lever for each engine. [figure 14-3] There is no mixture control and/or r.p.m. lever as found on piston engine airplanes. On the fixed shaft constant-speed turboprop engine, the power lever is advanced or retarded to increase or decrease forward thrust. The power lever is also used to provide reverse thrust. The condition lever sets the desired engine r.p.m. within a narrow range between that appropriate for ground operations and flight. Torque developed by the turbine section is measured by a torque sensor. The torque is then reflected on a cockpit horsepower gauge calibrated in horsepower times 100. Interturbine temperature (ITT) is a measurement of the combustion gas temperature between the first and second stages of the turbine section. The gauge is calibrated in degrees Celsius. Propeller r.p.m. is reflected on a cockpit tachometer as a percentage of maximum r.p.m. Normally, a vernier indicator on the gauge dial indicates r.p.m. in 1 percent graduations as well. The fuel flow indicator indicates fuel flow rate in pounds per hour. Propeller feathering in a fixed shaft constant-speed turboprop engine is normally accomplished with the condition lever. An engine failure in this type engine, however, will result in a serious drag condition due to the large power requirements of the compressor being absorbed by the propeller. This could create a serious airplane control problem in twin-engine airplanes unless the failure is recognized immediately and the affected propeller feathered. For this reason, the fixed shaft turboprop engine is equipped with negative torque sensing (NTS). Negative torque sensing is a condition wherein propeller torque drives the engine and the propeller is automatically driven to high pitch to reduce drag. The function of the negative torque sensing system is to limit the torque the engine can extract from the propeller during windmilling and thereby prevent large drag forces on the airplane. The NTS system causes a movement of the propeller blades automatically toward their feathered position should the engine suddenly lose power while in flight. The NTS system is an emergency backup system in the event of sudden engine failure. It is not a substitution for the feathering device controlled by the condition lever. In a free power-turbine engine, such as the Pratt & Whitney PT-6 engine, the propeller is driven by a separate turbine through reduction gearing. The propeller is not on the same shaft as the basic engine turbine and compressor. [figure 14-5] Unlike the fixed shaft engine, in the split shaft engine the propeller can be feathered in flight or on the ground with the basic engine still running. The free power-turbine design allows the pilot to select a desired propeller governing r.p.m., regardless of basic engine r.p.m. A typical free power-turbine engine has two independent counter-rotating turbines. One turbine drives the compressor, while the other drives the propeller through a reduction gearbox. The compressor in the basic engine consists of three axial flow compressor stages combined with a single centrifugal compressor stage. The axial and centrifugal stages are assembled on the same shaft, and operate as a single unit. Inlet air enters the engine via a circular plenum near the rear of the engine, and flows forward through the successive compressor stages. The flow is directed outward by the centrifugal compressor stage through radial diffusers before entering the combustion chamber, where the flow direction is actually reversed. The gases produced by combustion are once again reversed to expand forward through each turbine stage. After leaving the turbines, the gases are collected in a peripheral exhaust scroll, and are discharged to the atmosphere through two exhaust ports near the front of the engine. A pneumatic fuel control system schedules fuel flow to maintain the power set by the gas generator power lever. Except in the beta range, propeller speed within the governing range remains constant at any selected propeller control lever position through the action of a propeller governor. The accessory drive at the aft end of the engine provides power to drive fuel pumps, fuel control, oil pumps, a starter/generator, and a tachometer transmitter. At this point, the speed of the drive (N1) is the true speed of the compressor side of the engine, approximately 37,500 r.p.m. Powerplant (engine and propeller) operation is achieved by three sets of controls for each engine: the power lever, propeller lever, and condition lever. [figure 14-6] The power lever serves to control engine power in the range from idle through takeoff power. Forward or aft motion of the power lever increases or decreases gas generator r.p.m. (N1) and thereby increases or decreases engine power. The propeller lever is operated conventionally and controls the constant-speed propellers through the primary governor. The propeller r.p.m. range is normally from 1,500 to 1,900. The condition lever controls the flow of fuel to the engine. Like the mixture lever in a piston-powered airplane, the condition lever is located at the far right of the power quadrant. But the condition lever on a turboprop engine is really just an on/off valve for delivering fuel. There are HIGH IDLE and LOW IDLE positions for ground operations, but condition levers have no metering function. Leaning is not required in turbine engines; this function is performed automatically by a dedicated fuel control unit. ITT (interstage turbine temperature) indicator. The ITT indicator gives an instantaneous reading of engine gas temperature between the compressor turbine and the power turbines. The torquemeter responds to power lever movement and gives an indication, in foot-pounds (ft/lb), of the torque being applied to the propeller. Because in the free turbine engine, the propeller is not attached physically to the shaft of the gas turbine engine, two tachometers are justified—one for the propeller and one for the gas generator. The propeller tachometer is read directly in revolutions per minute. The N1 or gas generator is read in percent of r.p.m. In the Pratt & Whitney PT-6 engine, it is based on a figure of 37,000 r.p.m. at 100 percent. Maximum continuous gas generator is limited to 38,100 r.p.m. or 101.5 percent N1. The ITT indicator and torquemeter are used to set takeoff power. Climb and cruise power are established with the torquemeter and propeller tachometer while observing ITT limits. Gas generator (N1) operation is monitored by the gas generator tachometer. Proper observation and interpretation of these instruments provide an indication of engine performance and condition. The beta range of operation consists of power lever positions from flight idle to maximum reverse. Beginning at power lever positions just aft of flight idle, propeller blade pitch angles become progressively flatter with aft movement of the power lever until they go beyond maximum flat pitch and into negative pitch, resulting in reverse thrust. While in a fixed shaft/ constant-speed engine, the engine speed remains largely unchanged as the propeller blade angles achieve their negative values. On the split shaft PT-6 engine, as the negative 5° position is reached, further aft movement of the power lever will also result in a progressive increase in engine (N1) r.p.m. until a maximum value of about negative 11° of blade angle and 85 percent N1 are achieved. Operating in the beta range and/or with reverse thrust requires specific techniques and procedures depending on the particular airplane make and model. There are also specific engine parameters and limitations for operations within this area that must be adhered to. It is essential that a pilot transitioning to turboprop airplanes become knowledgeable and proficient in these areas, which are unique to turbine-enginepowered airplanes. The typical turboprop airplane electrical system is a 28-volt direct current (DC) system, which receives power from one or more batteries and a starter/ generator for each engine. The batteries may either be of the lead-acid type commonly used on piston-powered airplanes, or they may be of the nickel-cadmium (NiCad) type. The NiCad battery differs from the lead-acid type in that its output remains at relatively high power levels for longer periods of time. When the NiCad battery is depleted, however, its voltage drops off very suddenly. When this occurs, its ability to turn the compressor for engine start is greatly diminished and the possibility of engine damage due to a hot start increases. Therefore, it is essential to check the battery’s condition before every engine start. Compared to lead-acid batteries, high-performance NiCad batteries can be recharged very quickly. But the faster the battery is recharged, the more heat it produces. Therefore, NiCad battery equipped airplanes are fitted with battery overheat annunciator lights signifying maximum safe and critical temperature thresholds. The DC generators used in turboprop airplanes double as starter motors and are called “starter/generators.” The starter/generator uses electrical power to produce mechanical torque to start the engine and then uses the engine’s mechanical torque to produce electrical power after the engine is running. Some of the DC power produced is changed to 28 volt 400 cycle alternating current (AC) power for certain avionic, lighting, and indicator synchronization functions. This is accomplished by an electrical component called an inverter. Multiengine turboprop airplanes normally have several power sources—a battery and at least one generator per engine. 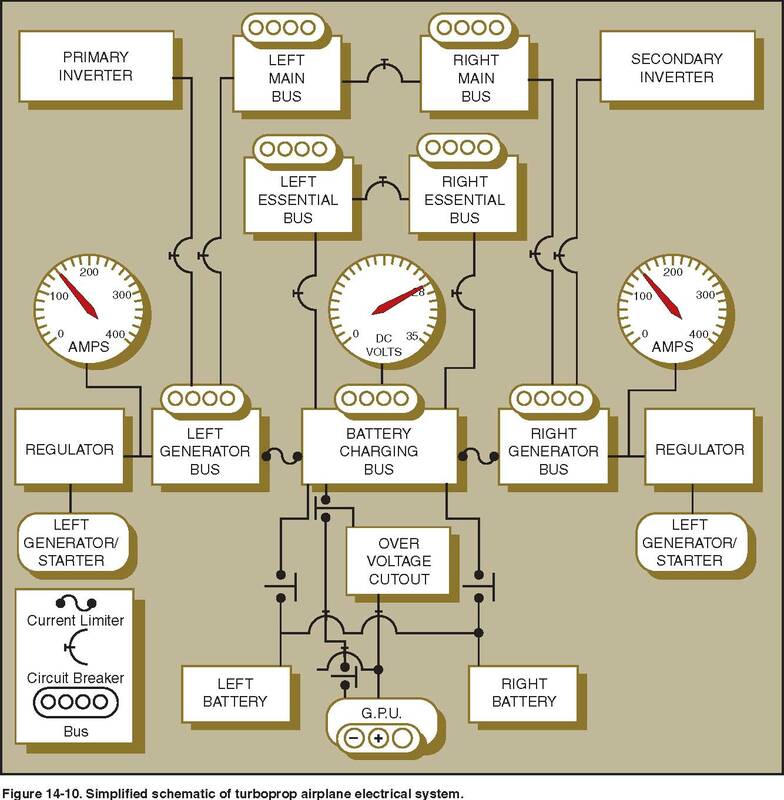 The electrical systems are usually designed so that any bus can be energized by any of the power sources. For example, a typical system might have a right and left generator buses powered normally by the right and left engine-driven generators. These buses will be connected by a normally open switch, which isolates them from each other. If one generator fails, power will be lost to its bus, but power can be restored to that bus by closing a bus tie switch. Closing this switch connects the buses and allows the operating generator to power both. Power distribution buses are protected from short circuits and other malfunctions by a type of fuse called a current limiter. In the case of excessive current supplied by any power source, the current limiter will open the circuit and thereby isolate that power source and allow the affected bus to become separated from the system. The other buses will continue to operate normally. Individual electrical components are connected to the buses through circuit breakers.A circuit breaker is a device which opens an electrical circuit when an excess amount of current flows. As previously stated, a turboprop airplane flies just like any other piston engine airplane of comparable size and weight. It is in the operation of the engines and airplane systems that makes the turboprop airplane different from its piston engine counterpart. Pilot errors in engine and/or systems operation are the most common cause of aircraft damage or mishap. The time of maximum vulnerability to pilot error in any gas turbine engine is during the engine start sequence. A condition where the engine is accelerating more slowly than normal is termed a hung start or false start. During a hung start/false start, the engine may stabilize at an engine r.p.m. that is not high enough for the engine to continue to run without help from the starter. This is usually the result of low battery power or the starter not turning the engine fast enough for it to start properly. Takeoffs in turboprop airplanes are not made by automatically pushing the power lever full forward to the stops. Depending on conditions, takeoff power may be limited by either torque or by engine temperature. Normally, the power lever position on takeoff will be somewhat aft of full forward. Takeoff and departure in a turboprop airplane (especially a twin-engine cabin-class airplane) should be accomplished in accordance with a standard takeoff and departure “profile” developed for the particular make and model. [figure 14-11] The takeoff and departure profile should be in accordance with the airplane manufacturer’s recommended procedures as outlined in the FAA-approved Airplane Flight Manual and/or the Pilot’s Operating Handbook (AFM/POH). The increased complexity of turboprop airplanes makes the standardization of procedures a necessity for safe and efficient operation. The transitioning pilot should review the profile procedures before each takeoff to form a mental picture of the takeoff and departure process. For any given high horsepower operation, the pilot can expect that the engine temperature will climb as altitude increases at a constant power. On a warm or hot day, maximum temperature limits may be reached at a rather low altitude, making it impossible to maintain high horsepower to higher altitudes. Also, the engine’s compressor section has to work harder with decreased air density. Power capability is reduced by high-density altitude and power use may have to be modulated to keep engine temperature within limits. A stabilized approach is an essential part of the approach and landing process. In a stabilized approach, the airplane, depending on design and type, is placed in a stabilized descent on a glidepath ranging from 2.5 to 3.5°. The speed is stabilized at some reference from the AFM/POH—usually 1.25 to 1.30 times the stall speed in approach configuration. The descent rate is stabilized from 500 feet per minute to 700 feet per minute until the landing flare. Landing some turboprop airplanes (as well as some piston twins) can result in a hard, premature touchdown if the engines are idled too soon. This is because large propellers spinning rapidly in low pitch create considerable drag. In such airplanes, it may be preferable to maintain power throughout the landing flare and touchdown. Once firmly on the ground, propeller beta range operation will dramatically reduce the need for braking in comparison to piston airplanes of similar weights. The medium and high altitudes at which turboprop airplanes are flown provide an entirely different environment in terms of regulatory requirements, airspace structure, physiological requirements, and even meteorology. The pilot transitioning to turboprop airplanes, particularly those who are not familiar with operations in the high/medium altitude environment, should approach turboprop transition training with this in mind. Thorough ground training should cover all aspects of high/medium altitude flight, including the flight environment, weather, flight planning and navigation, physiological aspects of high-altitude flight, oxygen and pressurization system operation, and high-altitude emergencies. Flight training should prepare the pilot to demonstrate a comprehensive knowledge of airplane performance, systems, emergency procedures, and operating limitations, along with a high degree of proficiency in performing all flight maneuvers and in-flight emergency procedures. The training outline below covers the minimum information needed by pilots to operate safely at high altitudes.